Guernsey Raiders head coach Jordan Reynolds says the next five games will define their season. The Raiders won 28-20 at Westcliff on Saturday, their fourth-successive win, to stay sixth in National Three London. But the club, who are 10 points off second place, play sides in the top seven in their next five matches. "A top two spot is mathematically there, but it's going to be pretty tough and we'll have to keep knocking out each game as it comes," he said. "We've got some huge games coming up, we're 10 points off second place and anything can happen during that time. "But playing teams like East Grinstead. 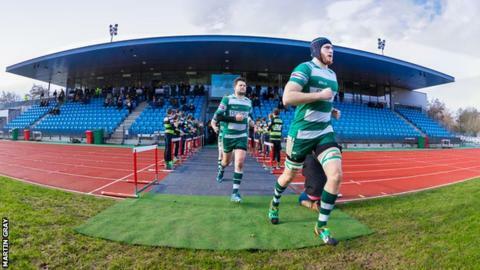 Westcombe Park, Tonbridge Juddians, and so on, they're going to be extremely tough games for us," Reynolds added BBC Radio Guernsey. Raiders only avoided relegation on the final day of last season but are now 40 points clear of the drop zone. "Last year we were around 10th and only just escaped relegation, now in what I would call the toughest season we've ever been in, we're in the mix. "58 points is a great achievement, but as yet but I don't feel we're finished and it'll be great to see where we are at the end of the season."